Most of you have today off as the Martin Luther King federal holiday! My hometown is Atlanta, Georgia. Though over 3 million people live there, few can say it is their hometown. I was born at St. Joseph's hospital when it was right down town—it has now moved to the suburbs. As an Atlantan, I heard a great deal about Dr. Martin Luther King, Jr. when I was growing up and I still remember the day he was shot. It was a dark time in our country — he was one of several great men who lost their lives for what they believed. Today should be a day we celebrate the dream he had and to recommit to that dream. We must never forget where we have been, how far we have come, and how much further we need to go! Which of these options is the best for you? The hotel group rate for the onsite option is only good through Jan. 27! So you need to get your room soon if you decide the beautiful white and warm beaches option is the one for you! Can't be free on the Thursday and Friday, Feb 23-24? Then why not get the DVD — it will be available in about 6-8 weeks after the event and then you can show it one section at a time throughout the year; check it out to individuals; or show it all in tact! It is yours to use as often and with whomever you wish! Speaking of Top in their field! I know we have mentioned this before, but we are just so proud of the CASE members who are part of the 2017 newly elected CEC Officers and Board of Directors! Just a special congratulations to CEC President Mikki Garcia, President elect Laurie VanderPloeg, and Board members Phyllis Wolfram, Mary Lynn Boscardin, and Julie Bost! Not a member of CEC? You need to seriously consider joining CEC. Did you know you cannot be a member of CASE unless you join CEC. We are the largest CEC division and we were the first division—1952! Do you know which of the CASE subdivisions (state/provincial units) was the first? If you think you know, go post it on the CASE Facebook page — we will put all the correct answers in for a special drawing! Watch for next week for the winner! Speaking of CEC... Be sure to look at all the Policy Insider entries below — lots going on this week in between the Beltway! Also, have you registered for the CEC convention in Boston yet? CASE will have lots of fun and meaningful activities going on during the convention! Mark you calendar to purchase your CASE Night ticket on Feb. 1 on the CASE website! These tickets typically sell out so get yours early! The price of the ticket will include dinner and a great visit to the New England Aquarium! We haven't had a poll for the last couple of weeks due to the holidays — and then a technical problem prevented us having one last week! SO ... please answer this one! We always want your input — it helps us as issues come up and we are asked what the CASE opinion is. 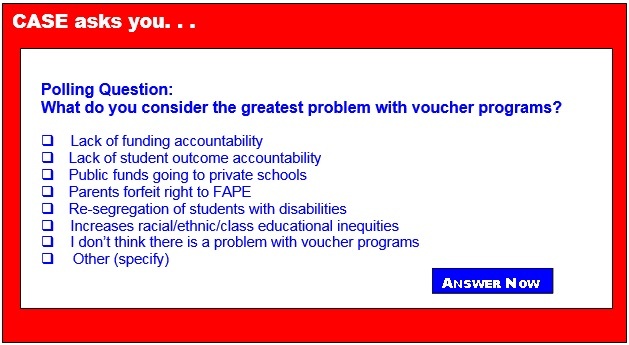 As I said last week we really need your opinion and the "voucher" topic is a huge one right now. CASE has a position but we may decide to strengthen it. Would you take a few minutes and let us hear from you? Thank you for all you do every day, every week, all month, and throughout the year!